Alphasat or Inmarsat-4A F4 (originally Alphasat I-XL or Inmarsat XL) is a joint ESA and Inmarsat communications satellite using the Alphabus proto-flight platform, achieving in-orbit validation of the ESA initiated platform through a commercial operator. Alphasat features a new generation digital signal processor for the payload, and a 12-meter aperture antenna reflector. The spacecraft has a mass of 6649 kg at launch, an electrical power of 12 kW. Planned for launch in 2012, Alphasat has a design lifetime of 15 years. The satellite is positioned at 25 degrees east, with its coverage centred over Africa and providing additional coverage to Europe, the Middle-East and parts of Asia. Implementation of this Geo-mobile application uses the Alphabus platform design in a configuration that requires a 90 degree change to the satellite flight orientation to improve accommodation of the feed/reflector configuration and allow the embarkation of a large deployable reflector. Both of these capabilities are offered as options in the Alphabus portfolio. An environment effects facility to monitor the GEO radiation environment and its effects on electronic components and sensors. 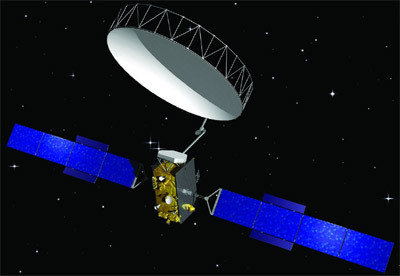 The Alphasat programme meets the diverse but mutually compatible goals of all the parties, such as the first flight and in-orbit verification of Alphabus and the implementation of an advanced L-band operational payload, which supplements the existing Inmarsat satellite constellation and offer the opportunity for new and advanced services. The contract was signed in November 2007 with a launch targeted by 2013.